Car sharing services cambio offers a great mobility solution for cities. A lot of city owners are actually better off with a shared car than a privately owned one. So the run-up to Antwerp becoming a low-emissions-zone—banning the most polluting cars from its city—was an ideal moment to get residents with older vehicles to consider cambio and its message: Each shared car replaces 12 privately owned vehicles. To get this message across, we crushed 12 cars and overnight we placed them as an art installation in one of the busiest streets of Antwerp. Each one of the wrecks had been the long treasured car of someone who agreed to have it crushed in exchange for a cambio subscription. 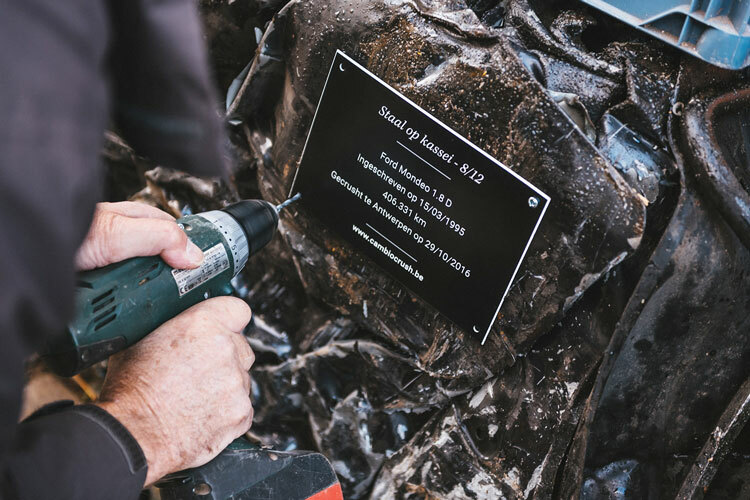 All the wrecks carried a plaque with the history of the car. The installation directed people to a website with a web documentary about the crushed cars and a tool to sign up for a cambio promotion. The web documentary was also used on Facebook and as YouTube pre-roll. The online campaign was supported offline with ads in newspapers. An estimated 15.000 people saw the installation. The national and local press covered the installation largely. The conversion to a cambio subscription was 2% higher than normal.